The brief for this project was two-fold: provide the school with a fresh presence from the street with a new Administration and Library building and solve the weathertightness issues that plagued the previous constructions. S&T devised a scheme that split the area into three parts with the Administration building at the front (facing the entrance of the school) and the Library located towards the back (near the existing teaching spaces). Connecting the two was a covered, central canopy space. As the first point of call, the new Administration building had to engage the wider community and provide a fun, vibrant place for students to call their own. The structure is “wrapped” in a vibrant mix of colour bands reflecting the school’s blue and white branding, offset by a bright red and darker grey. Five different types of carpet tiles carried on this enthusiastic colour scheme creating a cool, calm and fresh space geared to engage the children and encourage their focus while learning. The central canopy between the Administration building and Library acts as a recreational area where students can take shelter on rainy days or enjoy shared lunches served from the adjacent kitchen. The transparent roof allows light to filter through to the innermost sections of the Administration building while its access to the fields provides an open venue for events and exhibitions. 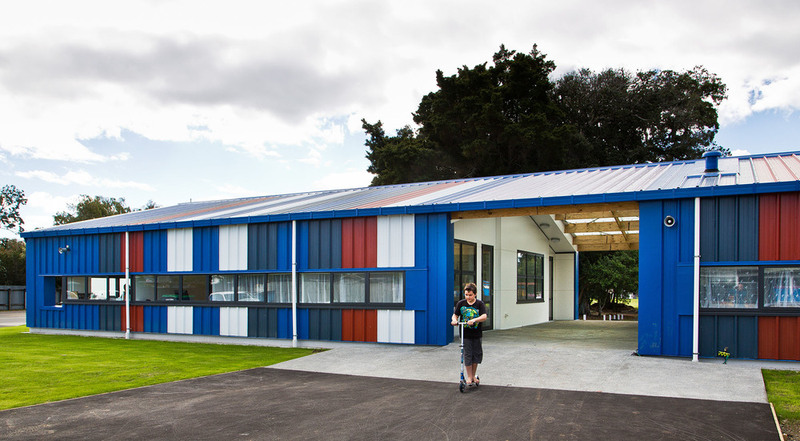 S&T worked with the staff and key stakeholders at Kereru Park Campus in South Auckland to construct an establishment which students could take ownership of. This ambition guided the choices of our designers for the site from the students picking colours to the adjustment of window heights .